Just like last weekend, Windsor will be absolutely jumping with activity this weekend. The Italian Village is one of the most popular destinations and is held right in the heart of Windsor’s Via Italia. Restaurants such as Il Gabbiano, Pasticcio, La Zingara, Centro, La Contessa and others will have extended patios into the streets and good times will be had. Along with their extended patio, Mezzo Ristorante will be hosting their monthly Supper Club on Friday, June 26, 2010. Dinner reservations begin at 7:30pm, and as always, Mezzo turns “club” at 9:00pm. If you can’t make it for dinner, meet some friends for a fabulous Mezzo martini after 9:00pm. 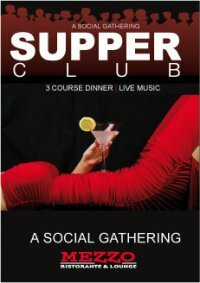 Each month, Mezzo’s Supper Club spotlights a local charity to benefit from this event. For June’s Supper Club, they are pleased to announce that they have chosen Lady Lumps Dragon Boat Team. This team will be rowing for Breast Cancer for The Dragon Boats for the Cure. Tickets are $40per person . If you are interested please contact Filip at filip@mezzo.ca or call 519.252.4055. Summerfest also continues this weekend with fantastic local act Michou opening up for popular Canadian group The Trews who will be playing an acoustic set at the Old Armouries in downtown Windsor. Tickets are $10. More info on purchasing tickets can be found on the Summerfest website. It’s Fine Art and Fine Wine at Pelee Island Winery on June 26 and 27 this weekend. They invite you to see the talent of our local artists as they display their fine art on the front yard at the winery. Rain or shine Pelee Island Winery will be having their barbeque set up with food and refreshments for sale with sales going towards a local charity. There will also be complimentary wine tastings and free tours all weekend. Those are just a few of the events going on this weekend in Windsor-Essex. We highly encourage you to go out and participate in them. As Pina and I always say, it is up to you to make the city and region you want to live in great. Or in a not so nice way, “use it or lose it”!